Since releasing their rather dark offering, Abysmal Thoughts, in 2017, a lot has happened in the world of The Drums. Line-up changes, break-ups, and personal growth have birthed their latest creation, Brutalism. With the dichotomy of upbeat sing-alongs, and quite upsetting topics, the album is a process of absolution for the man behind it all, Jonny Pierce. Brutalism is an album with a few tricks up its sleeve. On this record, The Drums explore a number of genres; but still, they maintain their sun-kissed existentialist mirage. Brutalism twists and turns through a number of glitched-out, engrossing moments, and simultaneously maintains the air of composure and fluidity present on their strictly arranged eponymous debut. Opener ‘Pretty Cloud’ projects 8-bit synthesisers, title track ‘Brutalism’ relies on perfectly crafted laissez-faire pop– but alongside that, ‘626 Bedford Avenue’ harks back to the traditionalised Drums summer sound of uptempo guitar licks. The best track on the album, ‘626 Bedford Avenue’, captures the gusto essence of the record in a sweet-sounding singalong. The ability of The Drums to incorporate a mixture of genre-typical styles into one coherent and splendid long-player is credit to their transformation and growth both as a band and as people. Jonny Pierce settles with emotional rawness; an album heavily based on dealing with his divorce, and coping with a sense of new life, the sadness paradigm is tackled on this record. 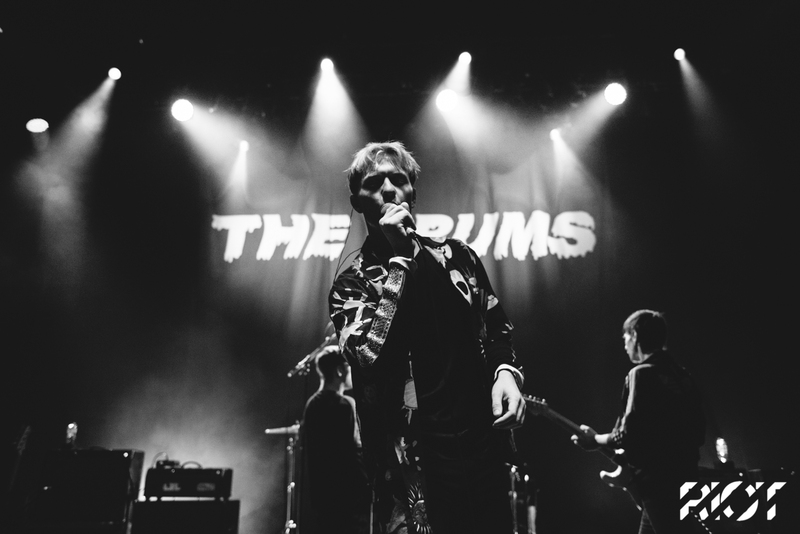 Instead, The Drums’ lyricism offers a sense of redemption and self-reflectiveness. In ‘Body Chemistry’ for example, there is unashamed self-aware and self-care based lyricism, and the album maintains a theme of longing, but acceptance of the situation one is landed in. With tracks like ‘Loner’ and ‘Kiss It Away’, Brutalism acknowledges often internalised issues of sadness, fragility, and anxiousness for the future. ‘Kiss It Away’ is a prime example, as Jonny Pierce lays his emotions out, and ‘Nervous’, an ode to his ex-husband, intensifies the very personal subject matter of the album. The musicality on show on Brutalism takes a step away from the guitar-based indie pop The Drums began with. Instead, they hark back to the Encyclopaedia days of spaced-out electronica, peppered with guitar riffs glistening with summer. The tracks on Brutalism are perfectly crafted pop songs; they are energetic, and they provide a platform for The Drums to assert their musical, and most distinctly, personal progression and integrity. Brutalism is out on April 5th. Pre-order here.